So for everyone that still follows updates on the website both our forums and our entire website has moved over to our brand new website! The new site features additional content from what was just located here, such as comics and silly things like that! There have been quite a few new additions since the public version of Black Sierra was released. These new additions consist of a new usable item for players to light up their surroundings for not only their selves, but for those around them too. Upon that, we’ve added in some new areas to the mines, and a handful of improvements to the overall map to allow for greater replayability and challenge, and of course as promised we’ve even updated the player model its self with a higher-quality one. So the first addition I am going to talk about are revisions to the campaign’s mining map, where new paths have been added to the map. In this new path that’s been merged into the old one, players reach into a darkened room where players have to start up a generator that’s been flooded with water to raise a gate as waves of monsters come into the room. Apart from the new section in the map, the map has had it’s difficulty (mainly in the amount of monsters that spawn) that make Black Sierra a lot more of an action packed game than previously. Another addition that has been added is a new item for players to use, players now are able to find and pickup flares to use in brightening up rooms. Players can pick up and carry two flares which they can then light, and drop on the floor which will provide an aura of light for everyone around. These flares last for roughly 10 minutes. The player model is a major improvement from the last which features redone animations, model, and textures. 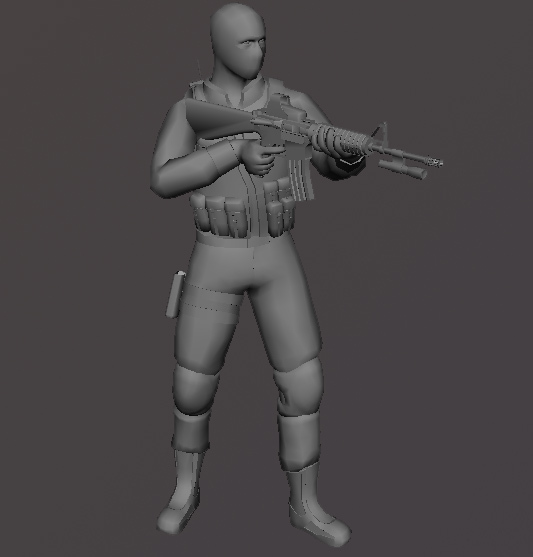 It has a few new selections so players can customize their player slightly (which is being planned to be added on to in further updates) with a few selections such as a helmet, goggles, and a mask. For those of you who have had any issues with v0.18 we’re happy to announce that some of the annoying bugs from the previous version have been fixed, such as you can adjust your video settings properly now, first person arms show up even if you don’t select a character, and it’s a lot easier to use objects this time around. If you haven’t played Black Sierra already, I would have to highly suggest that you do. If you have, well play it again! Black Sierra won’t release another public build for a couple of months as MSU goes on and we dive hard into working to make sure the next build is very polished and has a lot of content to sink your teeth into. So as this version will be submitted into the Make Something Unreal contest, we hope everyone enjoys it as much as we do. It’s improved greatly since our last public build, since everything is better with more carnage! Black Sierra is proudly powered by WordPress.